We are a public charity as described in IRS Exempt Organizations 501(c)3, incorporated in 2006. We are registered to do business in WI and MN. 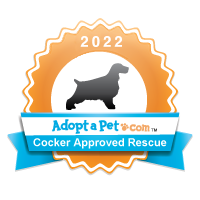 Our mission statement as a charitable organization is to provide quality services for rescue, rehabilitation, adoption, and/or retirement for cocker spaniels of all ages, regardless of health conditions, through placement in permanent homes, sanctuaries, and foster care programs. CSR tries to only take in as many Cockers as there are foster home available. CSR believes a home like setting is much preferable to a boarding kennel. However when the organization has large groups of dogs to Intake, CSR has to use boarding kennels. All of our dogs are spayed or neutered prior to adoption. We allow no exceptions. Our dogs are fully vetted prior to the adoption. According to insurance industry statistics, sixty percent of all dog bites occur to children under the age of 12, we encourage families with children over the age of 8 to apply for our rescue dogs. We do make exceptions, however on a case-by-case review. Our adoption team reviews all applications prior to any dog being adopted. We only adopt to families in WI, MN and IA. We require home visits for each adoption and follow-up correspondence yearly after the first 6 weeks. Inquires can also be sent to Cocker Spaniel Resources, Inc. by mail or via fax at 866-673-8571. Additional forms and application information can be found here on our resources page.